Wednesdays 5:10 – 5:50pm AND Saturdays 11:00-11:50am. Instruction combines grace and artistry with the excitement of theatre. The program includes instruction, competitions and performances, full ice. 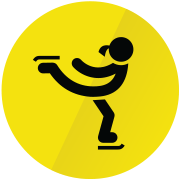 An opportunity to learn artistry and performance skills that do transfer to your singles skating programs in a team setting. Compete in team competitions, perform at The Q, and showcase their program in Pond shows and events. Teams are designated and built based on competitive skating level/test level, age, skating maturity and experience. * Final team placement is determined by coaches. Teams will be working with experienced Team coaches Kathy McKendry and Lori Rapposelli. For full details, see our 2019 Icelectrix Sat TOI Teams Reg. 2. Download and print our 2019 Icelectrix Sat TOI Teams Reg and mail or bring it to the Pond.